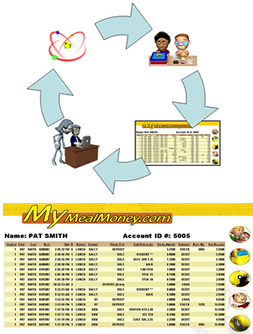 On-line meal account retrieval service developed by MiChoice is mymeal money.com can become an invaluable school food service software management tool. This web-based service allows parents to log on the Internet and check their child’s meal account balance as well as viewing a 30-day history of their child’s eating habits. It requires MiChoice’s Coms-Pro Central Office Software to be operational. Our back office software, Coms-Pro Central Office program, maintains a centralized database of all meal activities recorded daily at each school site lunchroom Point of Sale System. This centralized database is transferred daily from the child nutrition software back office program to our mymealmoney.com web site server allowing parents to log on the Internet and check their child’s meal balance.